In her blog, Jenny Levine points to an excellent information literacy game built by Scott Rice and Amy Harris at the University of North Carolina Greensboro Libraries. The game is interactive, allowing 1-4 players. 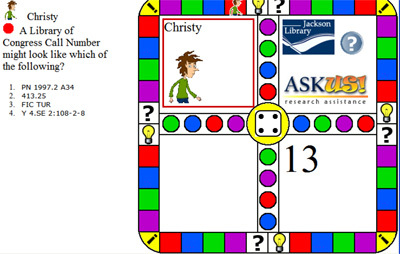 The game makes use of timed trivia-style questions, avatars and lots of colour. It looks fun and effective and I'll be interested in hearing about its impact.